Is Your Personal Injury Lawyer Really A Specialist? I was driving to court when I heard a local Huntsville lawyer on the radio. The lawyer begged for calls. He claimed expertise in legal fields as different as real estate, domestic, criminal, immigration and even personal injury. He did it all! And, he wanted you to call him for everything. Really? The law is complex. You won’t see that advertising lawyer handling all those different matters. He’s more marketer than lawyer. Although that Huntsville lawyer claimed to be a personal injury expert, I have not seen him at any civil trial dockets. None. I’ve practiced personal injury trial work for more than twenty years. I attend trial dockets regularly across northern Alabama. While the radio lawyer says he does it all, he really does not. Curious about this Huntsville lawyer who claimed to do it all, I looked at his website. He did advertise for personal injury cases. But, stuck at the end of his personal injury page was the disclaimer. He advertises for injury cases but refers them to other lawyers. It’s in the fine print. In the fine print, you see the truth. He will likely send your case to a real personal injury lawyer if he is unable to get a quick settlement. That’s deceptive. It’s wrong. Hurt people deserve better. A few years ago, the Insurance Journal published an article discussing legal malpractice. The author discusses a major concern for malpractice called the “door rule.” What is the door rule? 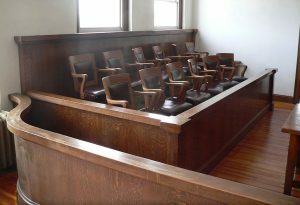 It’s “where law firms might choose to represent any client that walks in the door, even when the case involves unfamiliar territory.” The result — frequent legal malpractice. If you have a personal injury claim, that malpractice directly affects you. It lowers the value of your claim. It can even cause you to lose your claim needlessly. Are you getting the specialist you need? Or, is someone making marketing claims just to take a cut of your case. If you hire a personal injury lawyer, ask questions. Ask the lawyer — Will he or she be the primary attorney who files the lawsuit? If the case goes to trial, will he or she be the primary attorney at trial? Will he or she be willing to go to trial if necessary? Does the lawyer intend to refer your case outside his or her law firm if it does not settle? Hire a real personal injury lawyer who does not advertise simply to refer cases. And, hire a personal injury lawyer who will go to court. Many lawyers will not go to court and the insurance companies know that. I believe lawyers should truly practice in a specialty before advertising that specialty to the public. At the Blackwell Law Firm, we specialize. We don’t handle real estate, domestic or criminal matters. We handle only injury claims — injuries from things like car accidents, workplace accidents and defective products. Because we specialize, we focus all our time, energy and effort toward one goal — improving our skills as personal injury trial lawyers. We live in a world of advertising hype. If you are hurt, you need more than a slick marketer. You need a real lawyer.